An engaging story, gorgeous environment and well-written characters can't distract from the fact that Everybody's Gone To The Rapture's gameplay is buggy and lethargic. The use of video games as a platform for artistic storytelling is a fairly recent phenomenon that has divided the community right down the middle. Games like Dear Esther and Gone Home are the shining examples of the genre, garnering equal amounts of acclaim and disdain for their simple, unchallenging gameplay and thought-provoking narratives. 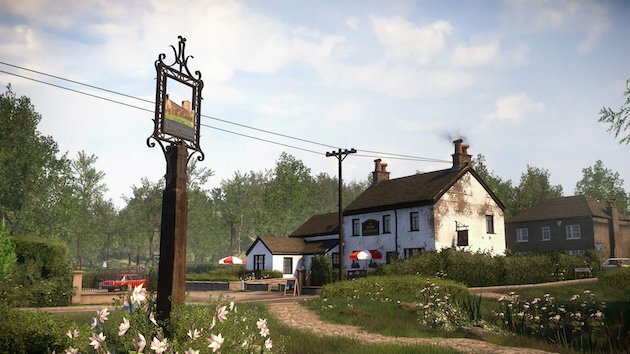 The Chinese Room, who created the former, can now add Everybody’s Gone To The Rapture to the genre, and once again, they’ve created a divisive title. 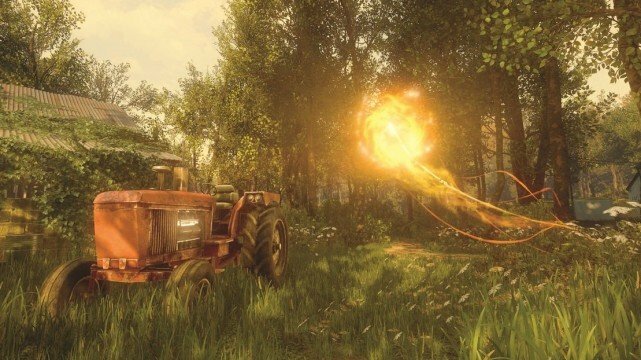 Although the phrase “walking simulator” has been disparagingly applied to artsy games before, Everybody’s Gone To The Rapture fully encapsulates the phrase, embracing it for better and for worse. This is a title that has created an air of intrigue around itself, teasing us with hints of a story that would make anybody curious enough to give it a try. In the beginning, you’re dropped into a beautiful English countryside and told that nobody is left. From there, you work your way into the town of Yaughton and surrounding areas, piecing together the events that led to the emptiness that pervades everything. 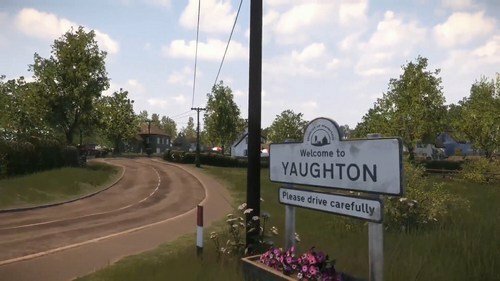 The mystery that holds up Everybody’s Gone To The Rapture is unraveled by a ball of golden light, which dances around the town and leads you to figments of the past. Rather than search for static documents of video logs, each figment is played out by figures made of light, representing a small conversation that took place in that spot. Most of these exchanges help to shed light on what the citizens of Yaughton were going through as the end drew near, but some are purely flavor text, giving us context into what these people were like. Mechanically, this is possibly the simplest game ever released on a console. You have three options for interaction: move with the left stick, look with the right, or interact with objects with the push of a button. You can also interact with some balls of light by tilting the Sixaxis to tune into a memory like a radio station. Unlike the tiny island from Dear Esther, Yaughton is quite an expansive area, and just about all of it is available for exploration. Split into a handful of areas, all connected by a main road, you are set loose and free to explore at your heart’s content. If you’re like me, you’ll spend hours shoving your nose into every corner you can find, stepping into abandoned homes and eerily silent pubs in search of clues. The Chinese Room truly excelled at fully realizing Yaughton, as the town is one of the most beautiful and memorable locales in gaming this year. Every detail is perfectly and purposefully placed, leaving haunting hints at what may have happened: bloody tissues wadded up on the floor, abandoned cars with doors flung open, dead birds littering the streets. Even smaller details are placed throughout the environment to add to the story in a completely organic matter. For example, a rock I found in the middle of a farm field was carved with the initials of various teenagers in the typical lovey-dovey fashion, and it almost made me tear up to see some recognizable names on it. These moments encompass what Everybody’s Gone To The Rapture can accomplish when it’s at its best. But The Chinese Room deserve top marks for the feeling of isolation they’ve managed to craft. Walking through an idyllic town and hearing nothing but the wind in the leaves is eerily effective, especially when the score ebbs and flows with the progress you make. The symphonic music is absolutely beautiful, swelling at the perfect moments and knowing when to step back and let the environment be. Each area focuses on the story of one key player, with each memory relating back to them in some way and usually culminating in an emotional climax that gives each character a decent amount of depth. The entire cast is voiced to perfection, and lines are wonderfully delivered. Without actually seeing another person along the way, I was able to create in my mind a look and attitude that seemed to fit with each one. While these looks behind the curtain offered more character depth than expected from most games, none of their backstories were particularly original. This isn’t always a bad thing, as a cliched story well told is still enjoyable, but I hoped for a bit more originality. One of my favorite stories came from a farmer haunted by his wife’s death and his drinking problem, and although it was definitely pulled from a huge list of cliches, it was effectively delivered. Revealing the story in the order you wish helps to give you a feeling of freedom and agency, making it feel like your hand is never held. However, a few flaws keep Everybody’s Gone To The Rapture from reaching masterpiece levels of interactive storytelling. The worst offender is the movement speed. While it seems like a complaint that the typical “modern gamer” would have, it’s actually a nearly fatal flaw that infuriated me constantly towards the back end of the game. Having a fully realized open world to explore is enticing, but only being able to explore it at a literal snail’s pace is, to put it bluntly, a waste of time. While it was enjoyable at first to painstakingly explore a small town house by house, once the game opened up into more forested environments, it became a chore to trek from locale to locale. Backtracking rears its ugly head later on, and although the story was enough to make me begrudgingly head back into the woods, I found myself doing chores while crawling back. I actually managed to wash a load of dishes by hand while rubber banding the left stick and occasionally tweaking the right. Again, it sounds like a complaint from an energy drink guzzling tween, but when combined with the glitchy light guide, it becomes a huge issue. During gameplay, the glowing light would occasionally guide me far off the beaten path just to turn around and lead me right back to where we started. Other times, it would get stuck in the environment and I would have to reload the game so I could continue. This is also a problem, because checkpoints are sparse and there’s no manual saves, which seems like a huge oversight given the exploratory nature of the game. On the PS4, it was easy enough to pause it and leave the system on rest mode until next time, but sometimes I found that the pause screen would freeze up, again leaving me to reload my save. Combining these issues with the lethargic movement speed constantly pulled me out of the engrossing story and exploration, reminding me that Everybody’s Gone To The Rapture is still a video game, and a problematic one at that. Still, I never completely gave up on my journey through Yaughton. 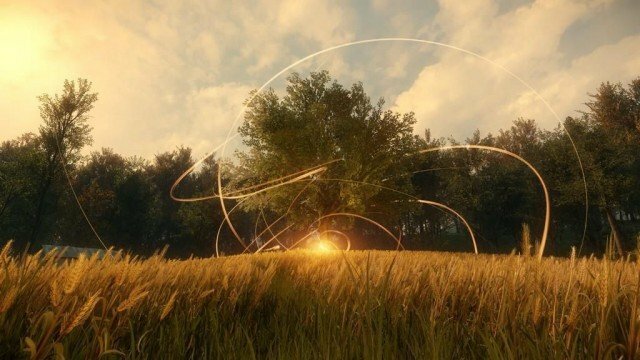 Despite the bugs, horrendous movement speed and somewhat obfuscated story, Everybody’s Gone To The Rapture engrossed me enough to see it through the full 6-7 hour experience. The stories, both personal and overarching, pulled me through the glaring flaws, even if I was pulled screaming and cursing. While the final section reaches microbrew swilling levels of pretension, the story is much easier to piece together than Dear Esther‘s, if only because this game actually has a plot. Enough is left to the imagination that we’ll be discussing the game with friends for months to come, but it’s not so vague that you’re left completely in the cold. Whatever Everybody’s Gone To The Rapture may be hailed as, it is most certainly not a masterpiece. It tells a beautiful and engaging story that is populated with a handful of wonderful characters, but you can’t release an interactive story on consoles and simply ignore the flawed mechanics and buggy build. The gameplay informs the story, and The Chinese Room are taking steps in the right direction, but until they can marry the two halves, they’ll still only be working with potential.